Everyone agrees that reading is important, but kids today tend to lose interest in reading before adolescence. 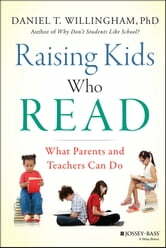 In Raising Kids Who Read, bestselling author and psychology professor Daniel T. Willingham explains this phenomenon and provides practical solutions for engendering a love of reading that lasts into adulthood. Like Willingham's much-lauded previous work, Why Don't Students Like School?, this new book combines evidence-based analysis with engaging, insightful recommendations for the future. Intellectually rich argumentation is woven seamlessly with entertaining current cultural references, examples, and steps for taking action to encourage reading. The three key elements for reading enthusiasm—decoding, comprehension, and motivation—are explained in depth in Raising Kids Who Read. Teachers and parents alike will appreciate the practical orientation toward supporting these three elements from birth through adolescence. Most books on the topic focus on early childhood, but Willingham understands that kids' needs change as they grow older, and the science-based approach in Raising Kids Who Read applies to kids of all ages. Debunking the myths about reading education, Raising Kids Who Read will empower you to share the joy of reading with kids from preschool through high school.